This car went through quite an evolution in its long career. 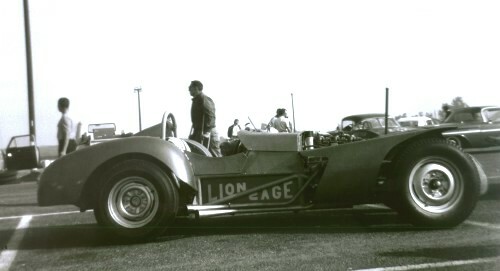 Starting as the Plymouth- powered Morgenson Special; then Buick power while campaigned by Max Balchowsky, and ending up as the Chevy-engined "Lioncage Special" with owner/driver Eric Hauser. Doug Stokes photo of Ol' Yaller I early in the Balchowsky era, maybe 1956 or 1957. Note spare tire "Continental kit". Does anyone know who's sitting in the car? Behind and partially hidden is Jerry Austin's D-Type Jaguar. The nose of Don Hulette's #204 Jaguar Special peeks into the frame at left. Ol Yaller I as the "Lioncage Special". 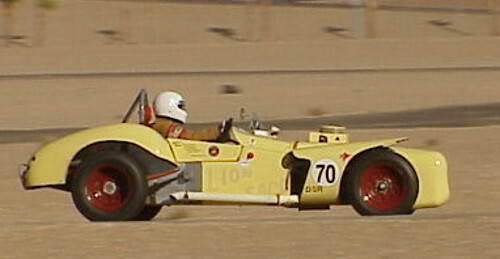 The first time I saw the car was at the prelims for the first Pacific Grand Prix at Laguna Seca on October 22-23, 1960. Eric Hauser won Saturday's amateur main event for modified cars. Below is Ol' Yaller I as it appears today. Similarities and differences are apparent. Note the difference in the rollbars: I'd hate to go on my head in the earliest version of the car shown in the top photo. Owner Mike Larkin has the car for sale. After he sells Ol' Yaller I, Mike's next project is the restoration of the "Sorrell Special", which burned at Riverside on March 4, 1962. Back to: George Keck -- Porsche "RSKeck"